Experience Nitmiluk Gorge (Katherine) with Destination Nitmiluk. The big question is not whether you should experience the world famous Nitmiluk Katherine Gorge, but how? Do you walk, canoe, boat or fly around the 12km-long series of 13 stunning gorges? The Katherine River flows through 13 separate gorges that weave their way through the Arnhem Land Plateau. Worn centimetre by centimetre from the red sandstone over the millennia, Nitmiluk (Katherine) Gorge snakes its way for 12km along the Arnhem Land Plateau on its way to the sea. As our cruise vessel drifts along on emerald waters between cliffs up to 70m high, our Aboriginal guide animatedly brings to life the stories of Bula the Creator and Nabilil, a dragon-like creature who camped at the entrance to the gorge. “He heard the song of the cicada – nit, nit nit – and called the place Nitmiluk,” he explains. Aside from cicadas, Nitmiluk is the traditional home of the Jawoyn people, who jointly manage the 292,008ha Nitmiluk National Park with the NT Parks and Wildlife Commission, as well as owning and operating Nitmiluk Tours. Around each bend brings another delight, like Butterfly Gorge, where a lovely, shady inlet is home to black and white butterflies flitting among the trees. Here the soft light floats with us along the river, highlighting mysteries of the Jawoyn Dreamings. The Creation being Bula travelled this land leaving his image as paintings in the rock shelters. A dip in paradise: Katherine Gorge, Nitmiluk National Park, NT. Estimates date the 400 recorded rock art sites at 10,000 years old. Often described as 13 gorges, Nitmiluk is actually one continuous cleft, turning left and right along fault lines and separated during the dry season by rock bars and rapids. The spectacle of the river hemmed in by red cliffs makes for a wonderful cruise or canoe trip, and at Nitmiluk bushwalkers are welcomed to tackle its many marked trails. Watching the water slip beneath the bow of the cruise boat you almost expect Bolung, the Rainbow Serpent, to surface from one of the deep green pools. According to the Jawoyn, Bolung must not be disturbed. We do not see the mythical serpent and the vessel journeys on, each of us safe in the knowledge that our visit has been blessed by a Creation being. “Canoeing up the gorge amongst the crocs with the red cliffs rising up on either side is just spectacular,” says David Koch. Hire a canoe from the visitors centre in the national park and go at your own pace – you should reach the third gorge in a day. From this perspective the cliffs look even more dramatic and you might spot wallabies and water monitors along the banks as you paddle by, with time to stop for a swim, walk or picnic. A well-earned soak on the Jatbula Trail. There are more than 100km of walking trails around the gorge, allowing visitors to take their time and meet much of the wildlife abundant in this lovely area, including the fish. Walking tracks abound in Nitmiluk National Park – each one offers differing views of the gorge from lookouts, the escarpment and along the banks. There are shorter walks from one to six hours, or adventurers can take a five-day hike along part of the epic Jatbula Trail. You’ll need a permit if you do an overnight walk. Top off your Katherine stay with a helicopter flight. 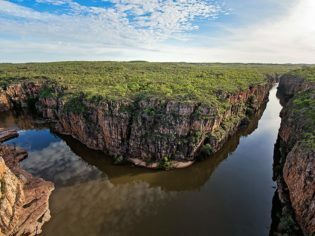 Nitmiluk Scenic Flights offers flights to three, eight or all 13 gorges. Seeing the landscape from above gives you a sense of how vast this Jawoyn-owned land is. If you’re staying at Cicada Lodge , you can upgrade the helicopter flight to an Adventure Swim Tour, which includes all 13 gorges and one of Australia’s most remote swimming holes, or do the Jawoyn Rock Art Tour and fly to an indigenous art site. Over thousands of years, Nitmiluk Gorge has been carved out of the sandstone cliffs of the Katherine River, creating 13 distinct gorges, each with its own stunning natural landmarks and steeped in the culture of the traditional owners – the Jawoyn. Nitmiluk is a destination that brings together cultural, nature and adventure experiences with a range of accommodation options, including boutique Cicada Lodge. The entire area around Katherine, located 340km south of Darwin, is characterised by limestone formations with bubbling thermal springs – and plenty of convoluted cave systems. To the south of Katherine is Cutta Cutta Caves Nature Park, featuring the Cutta Cutta cave, which is open to the public. The underground network of tropical limestone caves can be easily explored in an hour. The unique formations, created millions of years ago, are still growing today. The caves are home to native wildlife, glowing crystals, secret underground lakes and extraordinary helictites, which grow in any direction, defying gravity. Horseshoe bats also call the caves home, and with further permission you can go far deeper to spot the small, blind, albino micro beasts (a variety of shrimp), which are peculiar to a tiny region in Africa and these very caves. During WWII the caves were used and abused when the Japanese bombed Darwin and targets further south – stalactites still show remnants of gunshots – and there were numerous examples of sections of the cave system collapsing during the building of airstrips. Water from the caves travels more than 100km north, rising as hot springs in the Douglas Daly region. The most comfortable time to visit the Top End is in June and July. However, if you can handle hot and sticky weather, the Wet (January-March) is great for enjoying a lush and green landscape and barramundi fishing. Base yourself at Nitmiluk campground for easy access to the main attraction, Nitmiluk (Katherine) Gorge. Choose from powered camping sites, permanent tents, or one of the one or two-bedroom chalets. or splurge out and stay in the lap of luxury at Cicada Lodge. From Darwin, drive 315km south along the Stuart Highway, around a three-hour drive. The Nitmiluk Katherine gorge is located 29km from Katherine, along a sealed road. Along the way: Southeast of Adelaide River, you can venture east off the Stuart Hwy for a cold beer at the Grove Hill Pub and on to Pine Creek, or choose west along the Douglas Daly scenic route and stop for a dip at Robin Falls. Party pub: Grove Hill Heritage Hotel and Museum, Adelaide River NT (photo: Jen Pinkerton). Tjuwaliyn (Douglas) Hot Springs, a protected part of the Douglas River, is also teeming with an array of birdlife and mammals from flying foxes to bandicoots. East along the 4WD-only Goldfield Loop will take you through Hayes Creek to check out some historic sites from WWII. Leliyn (Edith Falls) makes for a refreshing dip (photo: Megan Arkinstall). Grab a bite at the Lazy Lizard Tavern at Pine Creek before heading on to wonderful Edith Falls at the northern end of Nitmiluk National Park. The walking tracks are terrific here, and built on the banks of Katherine River is Springvale Homestead, the Top End’s first cattle station, which is still open to the public and welcomes daily visitors. Katherine is home to the delightful Katherine Hot Springs, as well as an interesting Outback Heritage Museum, among other worthy sights. A trip through the Territory Wildlife Park, made up of 400 hectares of natural bushlands, is a great local tour – as is a three-day canoeing adventure down the sometimes-turbid waters of the Katherine River. Experienced Savannah Guide Mick Jerram touts this canoeing excursion as the perfect way to become immersed in a relaxing, stress-free environment while learning about the natural features of the Katherine River and its environment and ecosystems. You’ll paddle 40-55km through a wildlife-rich river system fed by springs and soaks throughout the long dry season, so there’s plenty of water on which to glide close to rocky banks, drift amid paperbark forests, race down small rapids and paddle through pandanus channels. Along the way ducks, egrets, herons, parrots, cockatoos and even the elusive brolga congregate along the shoreline, along with wallabies, euros, goannas, freshwater crocs and plenty of fish. At the end of each day as the canoe gently moves over calm waters, coming to rest on a secluded stretch of river sand, there’s a real sense of being in harmony with nature. See www.geckocanoeing.com.au for more information. The Daly Waters pub on the Stuart Highway is an outback icon. “A true blue Aussie experience” according to one reader, this outback pub in NT tops the list of Australia’s favourite watering holes. Located approximately 600km south of Darwin and 1000km north of Alice Springs, ‘We are in the middle of somewhere’ the website reads. Catering for all travellers passing through the area, the walls and ceilings are adorned with all kinds of memorabilia, from Irish football jerseys to bras of all sizes. The entertainment is typical Australiana – the resident performer Chilli shares funny stories about the early days in the Territory, paying homage to the historical roots of the town and the pub, which was built in 1930. Heading west on the Savannah Way? Spend a couple of nights at Bullo River Station. The 160,000-hectare Bullo River Station is a wilderness of red escarpments marked with boab trees (photo: Ewan Bell). Made famous by Sara Henderson in her autobiography From Strength to Strength, the station offers the quintessential Top End station adventure. Half a million acres, it has hot, thirsty plains with more than 8000 Brahman-cross cattle and dusty stock camps; rivers chock-full of crocodiles and barramundi; escarpments with centuries-old Aboriginal rock art; waterfalls and swimming holes; wetlands teeming with birdlife; wild buffalo, wallabies, dingoes and Bullo’s iconic boab trees. A state-of-the-art “solar temple” produces 24-hour green power. Activities include quad biking, horse riding, fishing, heli-mustering and scenic chopper rides. Fancy an outback, bush tucker dining experience?